Eabourne (Ebourne), Bourne, sheriff of Warwick, 410, 418, 626. Eadon (Eaden) (alias Elsden), Daniel, 22, 120. Earl Marshal and Deputy. See Marshal; Effingham, Earl of. Earle, Augustine, a Commissioner of Excise, 210. -, Giles, a Treasury Lord, 1, 2, 4, 5, 10, 11. EAST Barfield (co. Suffolk), 347. -, Dean (co. Sussex). 648, 839. -, INDIA COMPANY, 68, 241, 366, 531, 572, 586, 636, 642. -, -, -, annuity, 600, 793, 834. -, -, -, 1, 000, 000l. advanced by, 636, 642, 834. -, -, -, imports, 20. -, -, goods, 331, 770; Inspector of. See Clayton, C.
-, -, -, Act concerning importation of, 39. -, -, -, prohibited, 764. -, -, -, refreshing of, in warehouse, 39, 46. -, -, -, sales of, 330, 451. -, -, -, unrated, bonds and duties for, 366, 531, 781. -, -, warehouses London, 39; Comptroller of, 644. Eastbourne (Sussex), 534, 767, 786. Easthorpe manor (Essex), 317, 546, 558. Ecclesiastical Courts. See Advocate; Virginia. Eckersal (Eckersall), John, Receiver General of Customs, 67, 250, 252, 351, 551, 754. Eckley, Edmund, sheriff of Hereford, 188. Eden, Sir Robert, 130, 269, 358, 363. Edgcumbe, Richard, Mr. (from 1742 Baron Edgcumbe), 366, 834; Vice-Treasurer. Receiver or Paymaster General of Revenues, Ireland, 9, 217; pension to, 337; Chancellor of the Duchy, 601, 815, 827. Edinburgh, 4, 141, 155, 215, 311, 320, 346, 377, 462, 5489, 551, 554, 575, 5759, 674, 734, 774, 839. -, Bishopric of, 212, 651. -, -, Constable and Governor of. See Campbell, J.; Hamilton, G., allowance of grain to, 86, 923, 150. -, Customs Commissioners, residence in 115. -, Exchequer Chamber. See Exchequer (Court, Scotland). -, Merchant Company of, 753. -, rebels in, 735, 738. Edwin (Edwyn), Ann, 133, 370, 376. -, John, 704, 709, 773. Eeles, Isaac, sheriff of Surrey, 627, 639. Effingham, Earl of and Countess of. See Howard, A., F. and T.
Egerton, Honble., Henry, Bishop of Hereford, 237. -, Philip, sheriff of co. Chester, 418, 523. Egleton, C, sheriff of Middlesex, 625, 627. Ehrthal, Baron d', Envoy Extraordinary from the Elector of Mainz, 564, 618. Elibank, Lord. See Murray, A. and P.
-, lands of (Selkirk), 359. Elliot (Eliot, Elliott), Ann, 182. -, William, Receiver General, co. Cornwall, 230, 325, 343, 377, 549, 750. Ellis (Ellys), John, keeper of lions, &o. in the Tower, 398, 419, 627, 798, 823. -, -, director of the hospital in Flanders, 212, 271. -, William, royal bounty to, 76, 193, 230, 279, 339, 390, 403, 431, 476, 614, 641, 656, 687, 731, 812, 829. Ellison (Lieut). Col., Deputy Adjut. Gen., to Marshal Stair, 714, 716, 752. Elphinstone Lady Clementina, daughter of the Earl of Wigton and wife of Charles afterwards 10th Lord Elphinstone, 555. Elsworth (Elseworth), John, 315, 437. Elwes, Jeffrey, Treasurer to Queen Anne's bounty, 200, 426, 640, 831. -, on French ships, in consequence of war (17434. March 24), 467, 488, 491, 555, 568, 696, 701, 703; relaxation of, 570. -, on English ships in France, 491, 570, 574. -, on black cattle, &c., 742, 7878. -, William, keeper of the gate in Hyde Park, 88, 332, 388, 416, 427, 651, 796, 810. Emmanuel College. See Cambridge University. Engine for navigation, invention of, 295, 296. Engineer and Surveyor General, Ireland. See Dobbs, A.; Neville, A. J.
England, 122, 125, 129, 145. English Bicknor (Gloucester), 338, 484. -, Copper Company. See Copper. -, ships. See Ships, Embargo. Enlisting Englishmen into foreign service, 52, 131, 134, 188, 236, 314. Enumerated duties. See Four-and-a-half per cent. Episcopacy (Scotland), abolition of, 481. Equivalent Company, account of, 484. -, -, annuity, arrears due to, 238, 279, 2978, 304, 307. -, -, See also Scotland (creditors). Erskine, David, 21st Earl of Buchan, annuity or pension to, 159, 180, 190, 203, 396, 413, 429, 608, 622, 633, 796, 809, 824. Escheated Estates. 276, 530, 547, 564, 581, 699, 762, 770. See Radcliffe, W.
Eskrigge, Richard, sheriff of Bucks, 175, 193. Essex County, 114, 247, 546, 558, 562, 739, 752, 839. -, -, Receivers General of, 719. See Blackmore, J. -, -, sheriffs of, 417, 418, 627. See Ashurst, J.; Beavoir, O.; Hannot, J. -, Earl of. See Capell, W.
-, King's signature to, 57, 224, 297. Estimates and establishments. See Army; America (Expedition); Navy; Plantations; Gibraltar; Minorca; Marines; Ordnance; Services; Secretary at War; Transport; Flanders (army); Dutch; Danish; Hessian; Hanoverian. -, presentation of, to the House of Commons, 236, 782. Estreats, Common Pleas, Clerk of. See Eyre, E.
-, Clerk of. See Exchequer (Court Clerk. Eton (Bucks), 342, 426. -, College, perpetuity to Provost and Fellows of, 159, 179, 192, 204, 397, 414, 431, 623, 634, 798, 810, 822. Ettrick Forest (Selkirk), 347, 382; Chamberlain of, 218 see Murray, B.; Collector of see Rutherford, D.; Lordship of, 578. Evans [Absalom], a Page of the Bedchamber, 79, 266. -, John, searcher of cards and dice, 652. -, Richard, messenger, 209; tidesman, 647. Evelyn, Sir John, a Customs Commissioner, England, 71, 219, 472, 654. Exceedings. See Works (Office); Ordnance; Wardrobe; Concordatums; Military Contingencies; Barracks (Ireland). Exercise, books of. See Army. EXCHANGE, bills of (drawn from abroad mostly by Ambassadors for Extraordinaries), 6, 12, 15, 17, 43, 50, 66, 79, 82, 95, 98, 99, 140, 164, 166, 174, 181, 184, 194, 197, 2001, 242, 249, 252, 258, 266, 273, 281, 360, 389, 390, 398, 402, 4056, 411, 419, 424, 426, 603, 607, 6146, 620, 627, 631, 642, 715, 739, 808, 814, 8301; for the names of the persons on whom these bills were drawn see under Special services and especially Prevereau, D. and Weston, E. For Oglethorpe's bills from Georgia see Oglethorpe, J.; for bills for the Queen of Hungary see Austria; for bills for Sardinia see Sardinia; for bills for Newfoundland see Newfoundland and Smith, Thomas. -, -, commission on, 5. -, -, method of remittances by, from Wales, 2256. -, -, scarcity of, for remittances, 101, 512. -, RATE of, with Colonial moneys, 72930. -, -, for Danish troops, 38, 59, 60. -, -, with Flanders (for subsistence for the troops, including proposals for remittances), 32, 33, 368, 45, 51, 52, 54, 5760, 87, 138, 142, 2258, 245, 273, 443, 448, 513, 662, 670, 748; method of meeting loss by, in 1702, 37. -, -, with Genoa, 42, 3245. -, -, for Hanoverian troops, 225. -, -, for Hessian forces, 38, 59, 60, 225. -, -, with Holland, 2267. -, -, with Jamaica. See Jamaica (currency). -, -, with Minorca and Gibraltar, 12, 19, 96, 232, 257, 284, 318, 455, 469, 497, 505, 668, 68990, 693. EXCHEQUER, RECEIPT, ENGLAND, 10, 11, 22, 42, 67, 78, 97, 98, 245, 2501, 310, 337, 351, 361, 437, 556. -, -, -, annuity orders. See Annuity. -, -, -, Auditor of, passim. See Walpole, Lord R.
-, -, -, -, office of, 169, 400, 431, 610, 619, 635, 795; books of public revenue in see Beresford, J.; Register of Public Loans in see Tape, R., 171, 183, 203. -, -, -, Chamberlain and Deputy Chamberlain. See Exchequer Receipt (Tally Court). -, -, -, Chancellor and Under Treasurer of, passim. 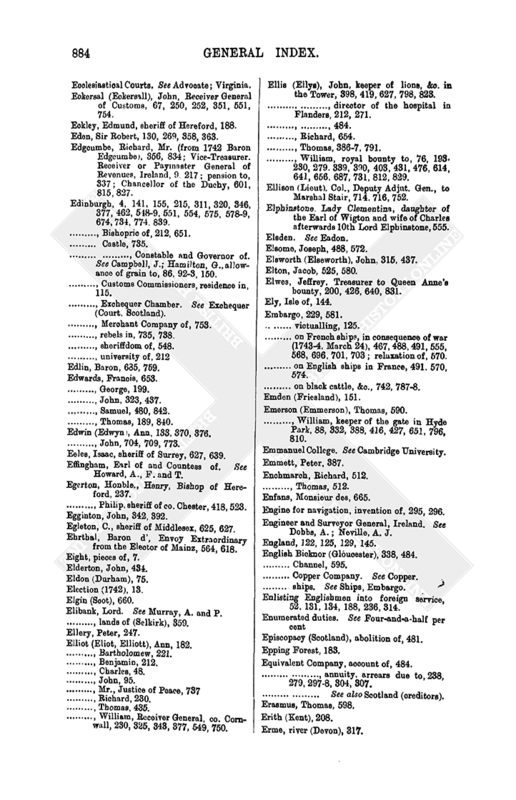 See Walpole, R.; Sandys, S.; Pelham, H.
-, -, -, -, house of, near the new Treasury, 63. -, -, -, -, perquisites of, 170. -, -, -, -, Secretary to, 782. See Roberts, J. -, -, -, clerks and ministers of, 170, 419, 630, 805. -, -, -, Clerk of Pells, 113, 1156, 118, 124, 136, 156, 252, 342, 431, 570, 573, 675, 749, 750, 752, 755, 768, 7856, 788. See Walpole, E.
-, -, -, deduction of 6d. per . See Deductions. -, -, -, forms of, 8. -, -, -, gate, porter at. See Bettridge, C.
-, -, -, letters of direction, 17. -, -, -, locking up treasure. See Bettridge, C.; Ballowe, H.
-, -, -, messengers. See Messengers. -, -, -, method of warranting payments for war extras, 257, 2612. -, -, -, officers, Latin order for, 310. -, -, -, offices of, ancient and new, issues for necessaries of, 1, 1923, 299, 404, 425, 468, 607, 6245, 8034, 825. -, -, -, payments into. See Customs; Excise. -, -, -, Records in. See Records. -, -, -, Register of Public Loans in. See Exchequer (Receipt Auditor's office). -, -, -, salaries and pensions payable in, 105, 496, 698. -, -, -, tallies, correction of, 254, 546; levying or striking of, 134, 170, 197, 342, 427, 545, 748, 785, 812, 829; renewal of, 573. -, -, -, Tally Court, 163, 541. -, -, -, -, officers and clerks of, 197, 228, 281, 3845, 405, 427, 477, 539, 614, 641, 697, 742, 813, 829. -, -, -, -, cutters, 252. -, -, -, -, Chamberlains of the Exchequer, 252; deputies to see Ballowe, H.; Farley, A., 116, 342, 344, 501. -, -, -, -, ushers of, See Beare, W.; Browne, A. -, -, -, Tellers. See Yorke, P.; Townsend, T., 457, 712, 747, 845; house of, 198, 248, 254. -, -, -, -, office of, 111, 309, 347, 349, 383, 545, 552, 553, 745, 757. -, -, -, -, vouchers, examiner of, 360. -, -, -, treasure in. See Bettridge, C; Ballowe, H.
-, -, -, Usher of. See Walpole, H., junr., 105, 338. -, -, -, -, house of, Trial of the Pix at, 772. -, -, -, -, issues to, for necessaries. See Exchequer, Receipt (offices). -, -, IRELAND, Clerk of the Pells and Clerk of the Treasury of. See Dodington, G.
-, -, on land tax 1741, 166. -, 1742, 122, 128, 201, 583. -, 1743, 1556, 3467, 404, 425, 780. -, 1744, 381, 383, 503, 545, 552, 622, 637. -, 1745, 589, 7478, 757, 818, 829. -, -, on malt l740, 26. -, 1742, 5, 6, 11011, 188, 339, 605. -, 1743, 349, 368, 425, 640. -, 1744, 503, 5523, 631. -, 1745, 750, 757, 767, 776, 829. -, -, on sweets [or sweet wines] (10 Geo. II), 376, 585. -, -, on victuallers' duty (old) (12 Geo. I), 309, 315, 376; on licences to sell spiritous liquors and strong waters (1743), 298, 300, 309, 315, 371, 420, 572. -, -, 2,000,000l. (11 Geo. I, c. 9), 390. -, -, certificates of outstanding bills, 166, 174, 190, 200, 392, 404, 416, 425, 603, 615, 628, 640. 801, 812, 822, 831, 835. -, -, contract for circulating. See Bank of England (circulating). -, -, discharge of. See Exchequer Bills (Paymasters). -, -, deficiencies on, 339. -, -, office incidents of, 120, 395, 555, 757. -, -, Paymasters of (including issues to, for discharge of Exchequer bills), 143, 166, 188, 193, 198, 201, 248, 309, 353, 3689, 404, 420, 425, 605, 622, 631, 637, 640, 818, 829. See Ball, E.: Anguish, E.; Britiffe, E.; Cookesey, R.
-, -, Trustees for circulating, 292. EXCHEQUER COURT. See Carolina (North). -, -, ENGLAND, 60, 233, 243, 485, 531, 613, 717. -, -, -, Auditors of land revenues, &c., 46, 213, 254. See Farrington, T.; Shelley, C.; Lowndes, W.
-, -, -, Barons of, 249, 322, 415, 485, 670, 762, 841. See Barker, E.; Clive, G.; Bromley, Sir W.; Sotherton, J.; Weston, Sir R.; Parker, Sir J.; Abney, Sir T.; Clerke, C.; Reynolds, J.; Fifth Baron of, 607 and see Barker, E.
-, -, -, Clerk of Foreign Estreats. See Walpole, H. junr. -, -, -, Deputy Chamberlains of. See Smith, J. & S., payments to, for joining tallies, 116, 163, 186, 288, 306, 344, 410, 568, 618, 806, 812. -, -, -, Foreign Apposer in. 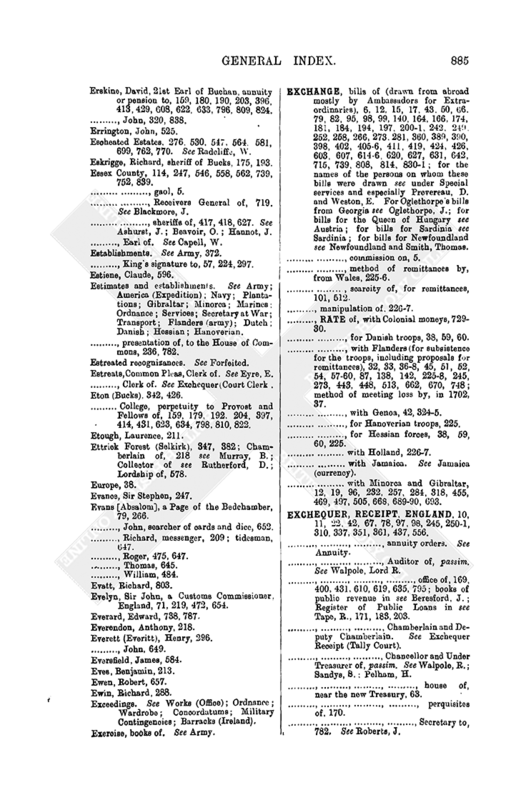 See Hammond, R.
-, -, -, King's Remembrancer in. See Masham, Lord, 26, 32, 108, 111, 113, 116, 1189, 128, 131, 1335, 1423, 148, 150, 160, 230, 269, 304, 317, 322, 341, 3435, 3489, 358, 360, 362, 365, 367, 370, 377, 379, 443, 496, 546, 549, 551, 56871, 5734, 5789, 583, 585, 5889, 681, 7504, 7578, 76973, 777, Deputy to see Taylor, C, 150, 345, 358, 370, 496, 574, 585, 7501, 758. -, -, -, -, office and officers of, 243, 249, 344, 365, 398, 541, 600. See Ord, H.; Woods, R.
-, -, -, Lord Treasurer's Remembrancer. See Mellish, W., 178, 357, 415, 547, 551, 574, 586, 590; deputy to, 362 see Barber, R.
-, -, -, -, office and officers of, 160, 378, 398, 624, 822; second secondary in office of see Bromfeild, H.
-, -, -, Pipe, Clerk of. See Henley, H. H., 14, 46, 109, 110, 1135, 123, 1279, 1312, 1356, 141, 150, 154, 345, 34951, 3535, 358, 360, 363, 365, 3678, 376, 37981, 545, 550, 553, 5578, 5613, 5689, 571, 573, 575, 581, 5878, 5912, 608, 7478, 758, 761, 763, 769, 775, 783, 7867; deputy of, 129, 1312, 351. -, -, -, -, officers of, 189, 412, 629, 632, 819. -, -, -, -, Comptroller and secondaries of, 415. -, -, -, -, Roll, 365, 378, 547, 5745, 586, 590. -, -, -, leases. See Crown lands. -, -, -, prosecutions and trials in, 88, 225, 2589, 372, 496, 767. -, -, -, Records of. See Records. -, -, -, Seal of, 154, 216, 322, 344, 350, 355, 379, 748, 761, 771, 777, 783. -, -, -, Solicitor for his Majesty's affairs in. See Andrews, R.
-, -, -, Usher (chief) of. See Walker, J.; payments to, for necessaries of the Exchequer Court, 16, 168, 189, 201, 395, 411, 430, 617, 625, 802, 824; house of, 243, 249; office of, 541; four ushers of, 310, 814. -, -, -, Chamber, Dublin, 5189. -, -, -, Chief Remembrancer. See Palmerston, Viscount. -, -, SCOTLAND, 212, 576. -, -, -, Barons of, 13, 23, 26, 36, 45, 53, 63, 72, 86, 923, 112, 121, 131, 139, 141, 1434, 155, 223, 231, 2335, 2379, 248, 268, 279, 291, 293, 2978, 304, 307, 320, 324, 343, 3468, 351, 359, 369, 467, 481, 484, 495, 508, 521, 5489, 574, 5778, 582, 673, 682, 697, 707, 7123, 750, 754, 757, 774. -, -, -, Chamber, Edinburgh, 92, 141, 155, 3467, 5489, 5778, 750, 774. -, -, -, criminal prosecutions in, 165. -, -, -, Solicitor to. See Bogle, J.; Lesley, J. -, -, -, Treasurer's Remembrancer, 646. -, -, -, Usher of, 396. See Bellenden, Lord; deputy to see Stephen, J. EXCISE, ENGLAND and new imposts. See Spiritous liquors. -, -, Accomptant General of, 41, 48. See Needler, H.; Comyn, V.
-, -, annuity out of, 824. 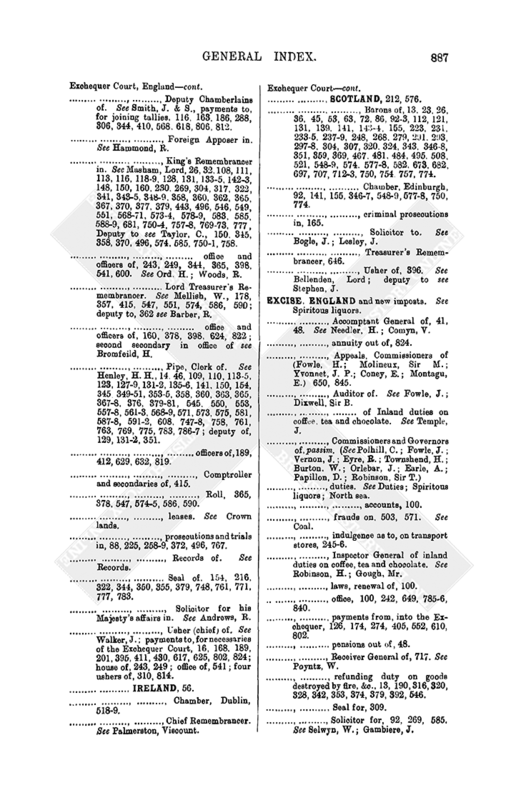 -, -, Appeals, Commissioners of (Fowle, H.; Molineux, Sir M.; Yvonnet, J. P.; Coney, E.; Montagu, E.) 650, 845. -, -, Auditor of. See Fowle, J.; Dixwell, Sir B. -, -, -, of Inland duties on coffee, tea and chocolate. See Temple, J. -, -, duties. See Duties; Spiritous liquors; North sea. -, -, -, accounts, 100. -, -, frauds on, 503, 571. See Coal. -, -, indulgence as to, on transport stores, 2456. -, -, Inspector General of inland duties on coffee, tea and chocolate. 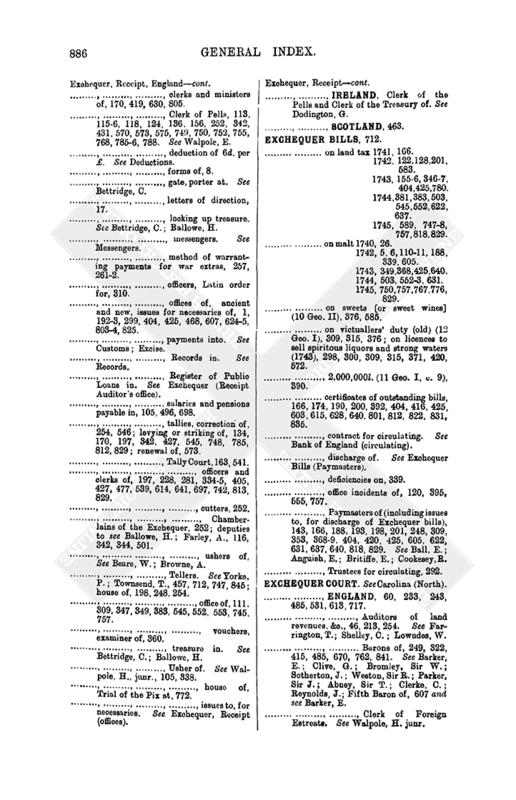 See Robinson, H.; Gough, Mr.
-, -, laws, renewal of, 100. -, -, office, 100, 242, 649, 7856, 840. -, -, payments from, into the Exchequer, 126, 174, 274, 405, 552, 610, 802. -, -, pensions out of, 48. -, -, Receiver General of, 717. See Poyntz, W.
-, -, refunding duty on goods destroyed by fire, &c., 13, 190, 316, 320, 328, 342, 353, 374, 379, 392, 546. -, -, Seal for, 309. -, -, Solicitor for, 92, 269, 585. See Selwyn, W.; Gambiere, J. -, IRELAND, Commissioners of. 650. 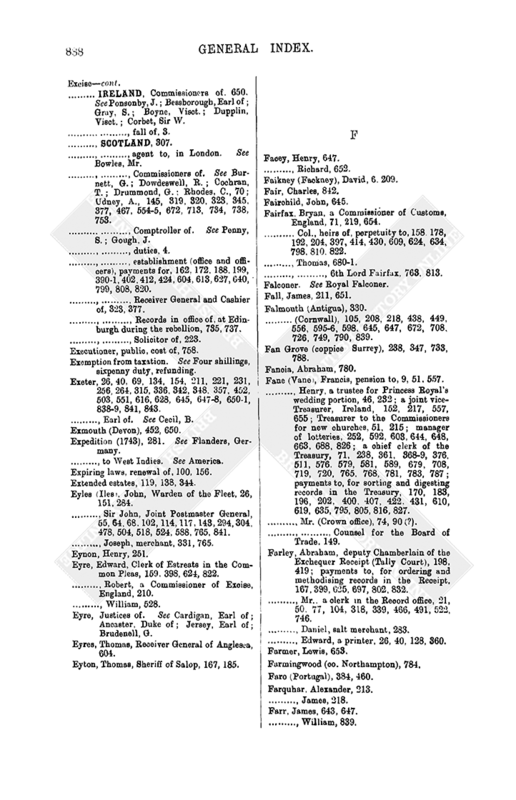 See Ponsonby, J.; Bessborough, Earl of; Gray, S.; Boyne, Visct. ; Dupplin, Visct. ; Corbet, Sir W.
-, -, fall of, 3. -, -, agent to, in London. See Bowles, Mr.
-, -, Commissioners of. See Burnett, G.; Dowdeswell, R.; Cochran, T.; Drummond, G.; Rhodes, C, 70; Udney, A., 145, 319, 320, 323, 345, 377, 467, 5545, 672, 713, 734, 738, 753. -, -, Comptroller of. See Penny, S.; Gough, J. -, -, establishment (office and officers), payments for, 162, 172, 188, 199, 3901, 402, 412, 424, 604, 613, 627, 640, 799, 808, 820. -, -, Receiver General and Cashier of, 323, 377. -, -, Records in office of, at Edinburgh during the rebellion, 735, 737. 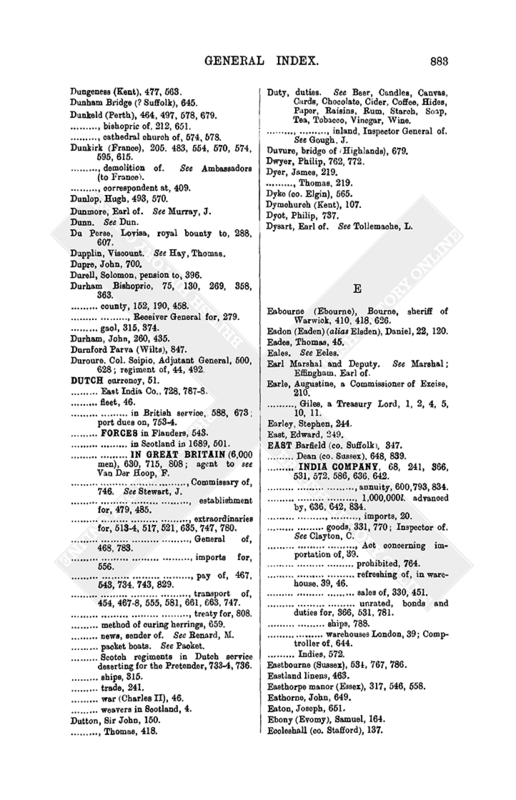 -, -, Solicitor of, 223. Executioner, public, cost of, 758. Exemption from taxation. See Four shillings, sixpenny duty, refunding. Exeter, 26, 40, 69, 134, 154, 211, 221, 231, 256, 264, 315, 336, 342, 348, 357, 452, 503, 551, 616, 628, 645, 6478, 6501, 8389, 841, 843. -, Earl of. See Cecil, B.
Expedition (1743), 281. See Flanders, Germany. -, to West Indies. See America. Expiring laws, renewal of, 100, 156. Extended estates, 119, 138, 344. Eyles (Iles), John, Warden of the Fleet, 26, 151, 284. -, Sir John, Joint Postmaster General, 55, 64, 68, 102, 114, 117, 143, 294, 304, 478, 504, 518, 524, 588, 765, 841. -, Joseph, merchant, 331, 765. Eyre, Edward, Clerk of Estreats in the Common Pleas, 159, 398, 624, 822. -, Robert, a Commissioner of Excise, England, 210. Eyre, Justices of. See Cardigan, Earl of; Ancaster, Duke of; Jersey, Earl of; Brudenell, G.
Eyres, Thomas, Receiver General of Anglesea, 604. Eyton, Thomas, Sheriff of Salop, 167, 185.